If there is any questions you can reply to this topic. Any problems will be edited. Hiiii, I'm Mosh c:. I will show you the way of the ninja. I will only be helping out with the magic part of the Oboro guide b/c physical will and always will inferior to the magic build. The reason why I'm only mentioning Oboro (female ninja) is because the female vs. male genders of the ninja have 3 different skills from each other. The male side of the 3 skills are more focused towards PVP while the females are more focused towards PVE. 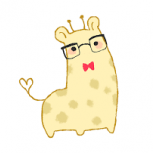 If you are reading this guide, you may be new to the server so first let me mention that there is Magic Critical in this server. (On the Niflheim side atleast). A goal you should set off for yourself is to reach 100% Variable Cast Time so that you don't need to rely on DEX stats. You can input LUK stats for your Critical Magic Ninja! Did I mention you don't need a Kiel Card or any sort of ACD. Well now I did. Throw Kunai - This will be your main skill from 1-99. 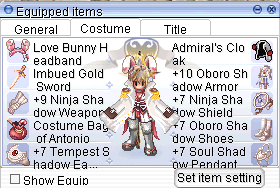 You'd want to farm the Golden Ninja Set from Rockridge Quest/Mobs once you are an Oboro to make leveling easier. It isn't hard to do so as these mobs are very easy to kill. 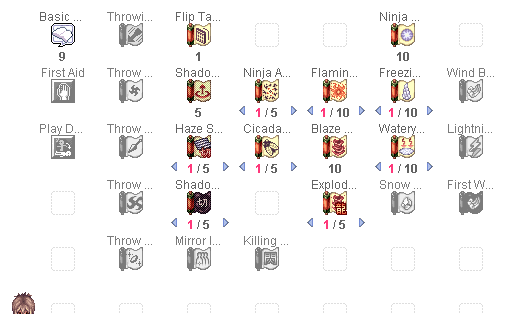 1-10 Prontera Field 6. or anywhere with porings/fabres/lunatics. 10-25 - Payon Dungeon 1. 25-35 - Ant Hell 1. Kill them eggs. 35-71 - Orc Dungeon 1. 71-91 - Geffen Field 6 or 8. Kill Petites. Change job. Get a few job levels. Level up, Swirling Petal or Kunai Splash. 130-175 - Charleston Crisis Instance. 160-185 - Illusion Dungeon Labyrinth/Luanda or MvP. Exploding Dragon - An OK skill. Used for mobbing. Cicada Skin Shed - Personal Favorite Skill to use as you can dodge any 3 physical attacks. 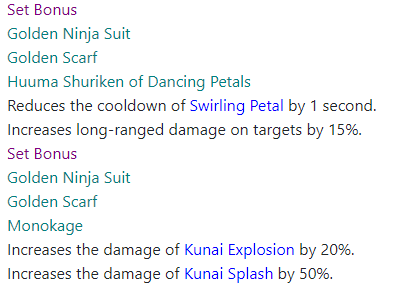 Ninja Aura - +5 str/int buff when used. To use this skill, your SP must end up even AFTER you use the skill. Otherwise your damage will drop significantly. Get ready to see higher numbers though when used correctly c:. Fire, Ice, and Wind Charms are the main focus in this build. Especially fire as it gives the most % boost to a skill called Flaming Petals. Wind Charms gives the same % boost to Wind Blade, but the skill is bad... nuff' said. 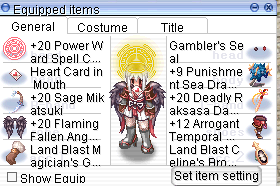 You can buy Charms at the upper left of Fortessa from a dealer named Amatsu Trader. Who wouldn't want free hp and sp regen. 10% hp/ 5% sp every second. ILL TAKE IT. Just be careful. you will be immobilized. BUT THERES A WAY. Zaha Doll Hat  - A magical headgear that works by procc'ing. 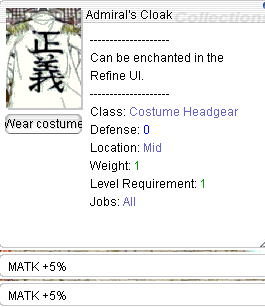 It increases flat MAtk by 30 per refine level when procc'ed. Also gives 10% magic damage to undead which isn't so bad. Would be my second choice of headgear if there was no spell circuit. It is dropped by White Lady or can be bought in the cash shop. Illusion Fancy Flower  - Decent HG. Can be combo'd with illusion bazerald. Obtainable in Illusion Dungeon. Beret - 10% demihuman resist. You can rock your looks with this headgear ;). Rachel Dungeon Vanberks drop these. Vesper Card - +2 Dex. Ignores 30% MDef of Boss Monsters. High Wizard Card - Ignores 100% MDef of Regular Monsters, but increases VCT by 100% ._. Robo Eye - 2% MATK and +1 Dex. Same as Magical Booster. Obtainable Cash shop or players. Heart Card in Mouth - A combo with Gambler's Seal. Will give you even more crit LMAO. Also will give you aspd which will benefit ninja's because Flaming Petals have no delay and is ASPD based. Obtainable from World Boss or players. Delicious Lollipop - A really good lower HG that isn't combo'd with anything. +5 matk, +1 aspd, reduces fixed cast time by 20%! Mmmm. Very delicious c:. 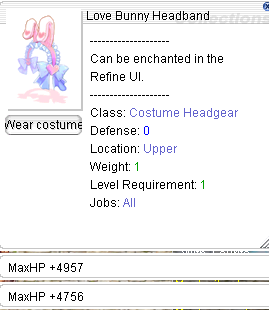 Obtainable from ... where the heck did I get this. Flattery Robe  - An armor giving 150 flat MAtk. Best when enchanted with Magic or Critical Enchants. Obtainable from Honor Token Exchange or players. 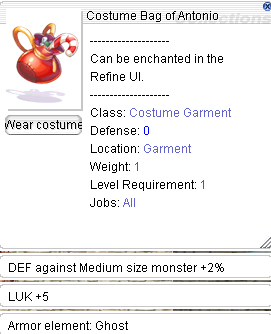 Abyss Dress - 40% more magical damage to Demon, Shadow, and Undead at +9. Can be really hard to obtain one though. Obtainable from Fortessa Pit or players. Airship‘s Armor - Beginner's Armor. HP and SP boost, +10 Mdef, +1 All stats. Obtainable in Airship. Agav Card - 5% MAtk. Mikatsuki  - Combos with Spell Circuit. Crimson Dagger  - Must be highly upgraded for better damage. Obtainable from many mobs. @whodrops Crimson Dagger, to find out. Bazerald - A really good dagger if you don't have a spell circuit yet. Can be enchanted in Malangdo. If enchanted go for Spell for VCT. Obtainable from Pharaoh. Illusion Bazerald  - A newer version of the Bazerald. Really good for Flaming Petals. 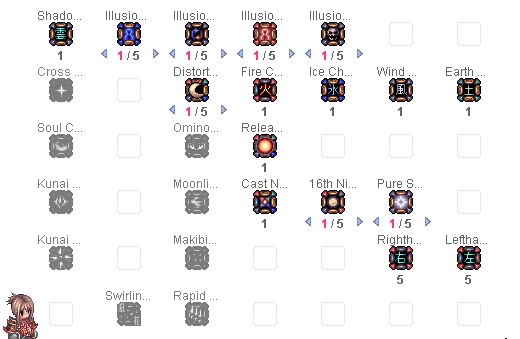 Obtainable in Illusion Dungeon Crafting. Immortal Wind Ghost Card - 10% MAtk. Chance of autocasting Killer Cloud LV 5 when using magical attack. Who cares. 2 Daggers are better. Fallen Angel Wings  - Best Garment as you can enchant it 3x with Spell at +9 and get up to 30% VCT. The only garment you need. Can't find any other garment that will give you more VCT than this. Nightmare Ancient Mummy Card - Reduce Damage from Neutral Property by 15%. Increase Fire Property Damage by 3% per refine. Faceworm Larva Card - Reduce Damage from Neutral Property by 15%. Increase Water Property Damage by 3% per refine. Temporal Int Boots  - Should be enchanted with Spell/Runaway Magic. Obtainable from Old Glast Heim crafting. Temporal Luk Boots  - Should also be enchanted with Spell/Runaway Magic. Obtainable from Old Glast Heim crafting. Nightmare Verit Card - Gives up to 10% MAtk at +9. Chambered RWC 2012 Pendant  - Only useful for its enchant. 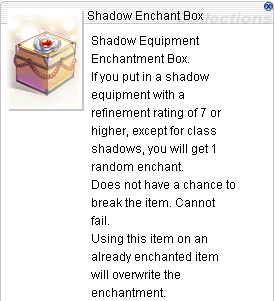 Needs Spell Enchants in order to achieve 100 VCT. Obtainable from Slots. Pendant Of Maelstorm  - Accessory used by almost all classes as it gives 6% atk and 6% matk. Obtainable from Jitterbug Instance Crafting. Magician's Gloves  - A must for any magic dps class. Ignores 50% mdef to all mobs including bosses! 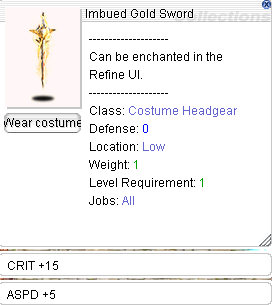 Obtainable from Fortessa Dungeon. Celine's Brooch  - +1 aspd 5% matk and 10% VCT. Everything a Oboro needs. Obtainable From Fortessa Pit. Mavka Card - Increase Fire and Earth Property Damage by 20%. Oboro Shadow Armor - Increases all your single target Magic DPS skills by 20%. 5% per refine. Ninja Shadow Shield - Ignore mdef of mobs and aspd bonus. Ninja Shadow Weapon - Up to 10% matk/atk when +9. Tempest Pendant Shadow - Same as Earring. 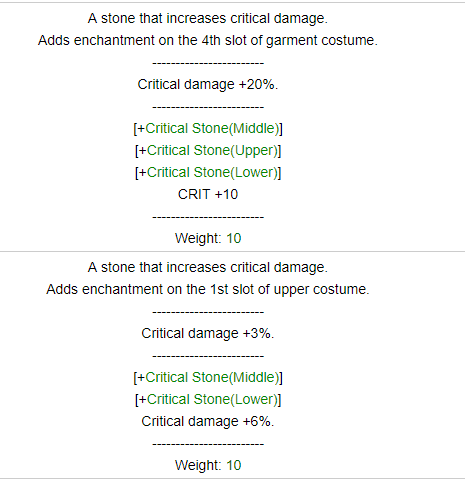 20% Critical Damage for Garment, 3% for the rest, and has set bonuses. Top Costume - Aim for as much HP you can get. Preferably 4k or higher hp enchants. Lower Costume - Crit/ASPD. If you don't have enough crit to reach the 100 crit point. 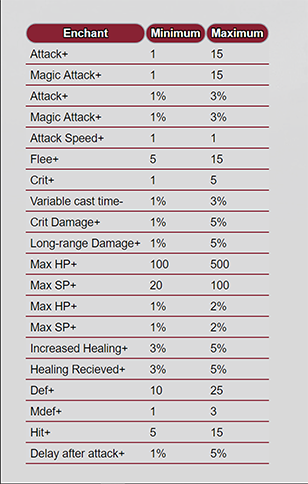 I prefer having crit enchant than aspd.